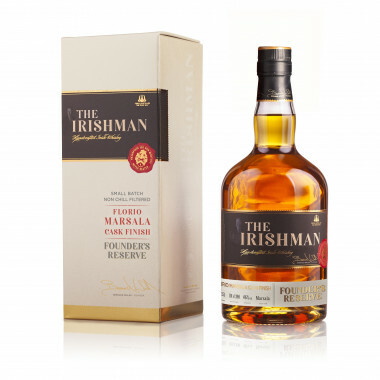 The Irishman Florio Marsala Cask Finish whiskey uses 70% of Single Malt and 30% of Single Pot Still. It received a Gold Award at the Irish Whiskey Awards in the Single Cask category in 2017. The latest edition of The Irishman brand is this Marsala finish whiskey, created by the founder Bernard Walsh. It is made of 70% of Single Malt and 30% of Single Pot Still. It has enjoyed a maturation in Bourbon American barrels like the Founder's reserve, the must-have of this range. This whiskey has then aged during 12 more months in Hogsheads barrels of Marsala from the Florio Winery in Sicily. Some spicy notes, malted flavours and summer fruits are abundant in this whiskey. It received a Gold Award at the Irish Whiskey Awards in the Single Cask category in 2017. In 1999, Bernard Walsh created The Irishman with his wife Rosemary, and launched his first Irish whiskey, both Single Malt and Blend, in 2006. The Irishman is one of the few independent distilleries selling whiskey, broadening the choice for whiskey fans. Combining traditional skills and modernity, Bernard Walsh gathers inspiration from the glorious era when Ireland was the largest whiskey exporter ahead of Scotland, in the 18th century and 19th century. The Irishman is inspired from two types of whiskey that where then produced: Single Malt and Single Pot Still (produced from malted barley and non malted barley).The Irishman was coined “the future of Irish whiskey”, by Bernard Walsh. Each step of The Irishman triple-distillation is carefully surveyed to produce the smoothest, most authentic, savory and complex whiskey. Eventually, Royal Oak in County Carlow will host the new distillery, the Walsh Whiskey Company, bound to be soon built soon as announced by Bernard Walsh. Nose: sweet wine from marsala, spices, vanilla and summer fruits. Palate: malted flavours, notes of red fruits, flowers notes and bourbon oak. Finish: stunning, nuts, sweet nougat, wooded and spicy. Gold Medal at the 2017 Irish Whiskey Awards, Single Cask category.